There's no doubt that the North East of England has its fair share of beauty, boasting no less than three National Parks and other Areas of Outstanding Natural Beauty. No wonder there are so many appealing destinations for caravan holidays in the North East of England. Visit Yorkshire, England's largest county, which covers much of the North East. Split into more manageable chunks, it covers four distinct areas: North Yorkshire, South Yorkshire, East Yorkshire and West Yorkshire. According to the National Caravan Council, Yorkshire is the county that boasts the largest number of people buying new caravans. It's also where a lot of the best caravan manufacturers are based. South Yorkshire and West Yorkshire are predominantly made up of townscapes – large conurbations like Bradford, with its award-winning Indian restaurants; Leeds, Huddersfield and Halifax; Sheffield, once renowned for its steelworks and Wakefield, in stark contrast, known for its rhubarb! Don't write off these urban sprawls as places not suitable for caravan holidays. Sheffield's civic buildings in the city centre are real gems, particularly the recently developed Winter Gardens while Halifax is home to Eureka! The National Children's Museum. If you and your family are keen on eating crumble, visit the Wakefield Rhubarb Triangle, a 9-square mile area between Wakefield, Morley and Rothwell that is home to some of the very best rhubarb growing in Britain. This potassium-rich dessert ingredient is considered worthy of appearing on the menus of top celebrity restaurants. Art lovers should also visit the Yorkshire Sculpture Park, staying at campsites near Wakefield, to see amazing sculptures by Henry Moore and Barbara Hepworth. Perhaps the least well-known area is the East Riding of Yorkshire. Its claims to natural beauty are the Yorkshire Wolds, a delightful ridge of chalk hills, quiet valleys and gentle streams. The Yorkshire Wolds Way allows walkers and cyclists to take advantage of its vantage points, with views over the Vale of York and Pickering and towards the coast. There are some excellent campsites in East Riding. Here, a long stretch of sandy beach runs from the popular seaside holiday resort of Bridlington in the north to Spurn Head, a spit that curls into the Humber estuary and Spurn National Nature Reserve, filled with bird life. Kingston upon Hull (Hull for short) offers walking trails, The Deep aquarium and cultural attractions for holidaymakers. North Yorkshire almost has too much beauty for one county! Its numerous alluring areas vie for the attention of caravan holidaymakers. The Yorkshire Dales or North York Moors? Historic cities or charming market towns? Countryside or coast? The Yorkshire Dales National Park is one of Britain's best-loved areas, with outstanding scenery of gentle dales, bubbling streams and picturesque settlements. Swaledale, Wensleydale and Wharfedale are, perhaps, the best known but Nidderdale (actually outside the National Park but considered an AONB) and the Ribble Valley are equally as beautiful. In amongst them are the less populated moorlands – all a part of The Pennines, with the Pennine Way long distance footpath stomping right through the centre of the Dales. On the other side of the main A1 road running north to south, and hugging Britain's east coastline is the North York Moors National Park, of significantly different character to that of its neighbour – you can see either park from the other. It is more remote, wilder, and more rugged than the 'gentleness' of the Dales. Although the moors are considerably lower in height than the peaks of Pen-y-ghent and Whernside within the Dales, they appear bleaker, the valleys (still called Dales) more enclosed. Look out for the beauty of Rievaulx Abbey, the charm of villages like Hutton-le-Hole, Danby and Goathland (where one-time TV programme Heartbeat was filmed), the natural wonder of the Hole of Horcum (a giant natural bowl), explore the magnificence of the North Yorkshire Moors Railway, and the ruggedness of the coastline. Yorkshire has hosted many TV programmes. In itself, the coastal villages like Runswick, Staithes and Robin Hood's Bay are more than attractive but they are, perhaps, surpassed by the main town of Whitby, known for its fishing fleet, its connection to Captain Cook, its 'up-on-high' Whitby Abbey and its connections to the gothic novel Dracula. And that's not forgetting the traditional seaside holiday town of Scarborough, lined with sandy beaches and culturally known for its Theatre-in-the-Round. York, by contrast, is a city made on tourism filled with more eye-level history than most can contemplate as Viking and Roman finds sit alongside more 'recent' history like that of the majestic York Minster and the birthplace of Guy Fawkes. Walk the Roman walls, soak up the atmosphere of the narrowest streets in England – The Shambles and Whip-ma-Whop-ma-Gate (yes, really), enjoy shopping along Stonegate and visit the world-renowned Jorvik Viking Centre, before taking a boat trip on the River Ouse, a waterway that is notoriously cruel to its host city in times of flood. Above North Yorkshire lies the North Pennines Area of Outstanding Natural Beauty, within which are the Durham Dales, most notably Teesdale and Weardale. Both river valleys show magnificent natural features such as High Force and Cauldron Snout waterfalls, only accessible on foot, while the heather moors lie wild and remote above. The Wear runs through the centre of Durham a city with UNESCO World Heritage status for the grandeur of its hilltop castle and cathedral. Beyond Durham is Tyne and Wear, the Angel of the North spreading her wings alongside the A1 to welcome visitors to Newcastle-upon-Tyne and Gateshead. Known as much for its shoppers' metropolis, the Metrocentre, as it is for the Tyne Bridge, Ant and Dec and The Magpies (Newcastle United FC), Newcastle is also home to the impressive BALTIC Centre for Contemporary Art, and the birthplace of George Stephenson, inventor of the steam railway. You can visit his birthplace in the village of Wylam, on the banks of the River Tyne, just to the west of Newcastle. One of the most undiscovered and least populated counties in the UK is Northumberland. Of all the counties in the northeast, it is possibly the most exciting to visit for a caravan holiday – quiet roads, vast open spaces and unsurpassed beauty. A quarter of the county is designated as the Northumberland National Park, and much of that is taken up by Kielder Forest and Water. Kielder Forest is the largest manmade woodland in Europe, full of red squirrels and cycleways, while Kielder Water is the largest manmade lake in England by capacity (the largest in surface area is Rutland Water in the East Midlands). Though manmade, it's hard to believe such is the attractiveness of the area, with tiny inlets and creeks feeding the reservoir and the North Tyne River. In the very north of the county, shared with neighbouring Scotland are the Cheviot Hills, while Northumberland's coast has vast, empty beaches under huge skies. Every now and again a magnificent castle like Bamburgh, Lindisfarne or Dunstanburgh pop up, defending the shoreline. Just inland is Howick Hall, home of Earl Grey tea and a few miles further inland still, the gorgeous town of Alnwick with its own Alnwick castle. Of course, Northumberland's history goes way beyond a castle built a few centuries ago. The Roman Hadrian's Wall cuts across the county east to west, a UNESCO World Heritage Site that is 84 miles long. You can walk virtually the full length on the long distance footpath, but a lot of the stone wall itself has gone. Some of the best stretches of Hadrian's Wall to see are those within the Northumberland National Park, around the attractive town of Haltwhistle, the 'capital' for walkers of Hadrian's Wall. If you enjoy caravan holidays in North East England, don't forget there are some wonderful campsites in Northumberland, camping and caravan parks in North Yorkshire, campsites in South Yorkshire and East Riding to use as a fantastic base from which to enjoy the best tourist attractions across the North East. Eat fish and chips on the harbourside. Whitby's fish and chips are considered some of the best in Britain – look out for renowned restaurants such as Trenchers, the Magpie, Hadleys or The Quayside fish and chip shop, which won the top gong in the 2014 National Fish and Chip Awards. Find the authors' haunts. Visit Brontës' Parsonage Museum in beautiful Haworth, with its cobbled streets, to learn more of the Brontë sisters, their lives in Yorkshire and their famous novels. Emily Brontë's novel Wuthering Heights, for instance, draws much of its drama from the wild West Yorkshire landscape. Drive across the Humber Bridge. An iconic symbol of Humberside, the Humber Bridge was once the longest single-span suspension bridge of its kind at 1.38 miles. It's still the seventh longest in the world and you can walk or cycle across in addition to driving. Visit The Humber Bridge Information Centre, which is situated in a large, free car park on the north side, adjacent to the Humber Bridge Country Park. See the Roman Emperor Hadrian's Wall. Take in the sights either by walking the Hadrian's Wall National Trail, cycling along the designated cycle route or travelling by train, using the Hadrian's Wall Country Line that links Newcastle and Carlisle. Roman tourist attractions to see along the way include Chester's Fort, Carrowburgh, Housesteads Fort and Vindolanda. Try a bungee jump. Visit the Tees Transporter Bridge in Middlesbrough and make it a day to remember with a bungee jump. It's the only bridge bungee jump in the UK – you climb the 210 steps to the top of the bridge before connecting a jump rope and plummeting 160 feet to the River Tees below. Events take place very much all year round in the North East, kicked off by the Tar Barle New Year celebrations in Allendale, Northumberland. In February Northumberland's Snowdrop Festival at Howick Gardens provides a welcome display. Also in February, York welcomes the huge Jorvik Viking Festival where boat burning and all-things Nordic come to the city. April and September are the months when Harrogate, North Yorkshire, lights up the region with two large-scale flower shows. Visit the Spring Flower Show in April and the Autumn Flower Show in September. In April Gateshead puts on its annual International Jazz Festival, the biggest UK Jazz festival outside London. In May, Northumberland's Amble Puffin Festival welcomes newly hatched arrivals on nearby Coquet Island every year. In June the Durham Regatta kicks off on the River Wear, the oldest regatta (pre-dating Henley) in England. September is the time for walkers to head to the North East for the Kielder Challenge Walk, the Yorkshire Wolds Walking Festival and the Great North Run. In October it's the Durham Book Festival, providing a quiet read after such a busy and active September. The M1 motorway is one of the quickest routes from the south, which runs as far as Leeds. From there on, take the A1(M) directly to Newcastle and the predominantly single carriageway A1 thereafter to Berwick-upon-Tweed. Travelling east-west, the M62, off the M1, serves the East Ridings and Humberside best while the A66 cross-Pennines route between the M6 at Penrith and the A1 (Scotch Corner) and the A69 between Carlisle and Newcastle-upon-Tyne provide scenic cross-country touring. Consider the weather conditions if using either of these routes during winter or when it's blustery. The A171 from Scarborough to Middlesbrough offers one of the best coastal routes, skirting the edge of the North York Moors; again, given its location on high ground, check weather and travel news as road conditions can change unpredictably fast in winter. You'll find rural country lanes to be considerably quieter than in other parts of the country, particularly if you're heading for Northumberland campsites and the more remote areas of the Pennines. 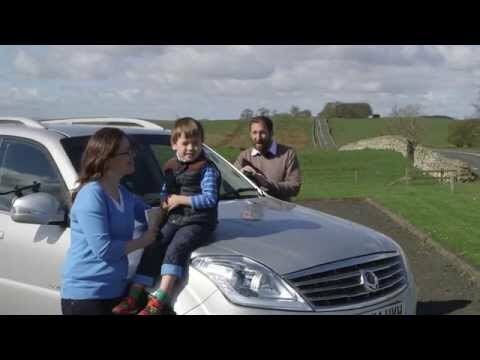 Only a few minor country roads are best avoided while towing a caravan – routes within the centre of the North York Moors National Park and Sutton Bank on the western perimeter of the Park. When driving to campsites in the Yorkshire Dales avoid the route from Thwaite, Swaledale to High Tan Inn, Arkengarthdale and the road from Kettlewell to Leyburn. Care should also be taken approaching campsites at Malham – consider phoning ahead to check for specific arrival and departure times to avoid meeting oncoming traffic along very narrow lanes. Humber Bridge tolls. There is no extra toll charge for towed caravans or motorhomes up to 3.5 tonnes on the Humber Bridge. Tees Transporter Bridge in Middlesbrough. Contact the bridge controllers before you get there – while caravans are accepted, they will want to know the overall length of your outfit in case it's too long. The bridge is open on weekdays and Saturdays, closing at night. It won't operate in fog, high winds or heavy rain.